The voters’ rejection of mainstream political parties has been the biggest trend in European politics for the past five years. But this weekend’s European Parliamentary elections saw the biggest shift to fringe parties yet. Nearly one third of those in the new European Parliament are dedicated to destroying the European Union. In the United Kingdom, France and Denmark, fringe parties beat their more established rivals to win the vote. Meanwhile bona fide neo-Nazis will sit in the European Parliament for the first time. These upstart parties are all very different. Some are genuinely racist. Others are clearly not, although they are given this label by critics. But across Europe the trend is the same. Voters are fed up with the mainstream parties, and want change. It’s a dangerous trend that will only intensify as Europe’s economic crisis deepens. For the first time since 1910, neither Labour nor Conservative parties win the British national election. The UK Independence Party (ukip) won 26.8 percent of the vote, followed by Labour and the Conservatives, which both won around 25 percent. The short-term impact is expected to be minimal. The vote went pretty much as expected, so while this is dramatic news, it is not surprising. Britain will elect a new government next year; however, twice the number of people are expected to turn out to vote in that election. Many ukip voters are expected to return to one of the traditional parties, meaning ukip could once again receive only a small percentage of the vote. But this election says something very important about Britain’s attitude to the European Union. ukip wants Britain out of the EU. Many Conservatives agree, and the official party line is that they want a new and different relationship with Europe. Between them, these two parties received more than half the vote. The Liberal Democratic party—Britain’s usual third party and member of Prime Minister David Cameron’s coalition government—went into this election as Britain’s most pro-European group. That vision was overwhelmingly rejected. The party finished in a humiliating fifth place, behind even the Green party, with less than 7 percent of the vote. The Liberal Democratic party has gone from having 11 Members of European Parliament (mep) to only one. The election results clearly show that Britain has completely rejected the current relationship with Europe. This election marked the first time France’s Front National came first in a national election; it won 25 percent of the vote. In 2009, it held three seats in the European Parliament—it now has 24. It was also the worst performance by French President François Hollande’s French Socialist party in its history, scoring only 14 percent. France’s political establishment did not expect a victory on this scale for Front National, and it is badly shaken. The Front National is often referred to as far right, but many of its economic policies are very socialist. It opposes not only the euro but also free trade. The party considers the idea of a free market as a kind of “Anglo-Saxon” conspiracy. Marine Le Pen has tried to take the party more mainstream since she took over leadership from her father. However, to many it is tainted by anti-Semitism and racism. After it won leadership of several French towns earlier this year, the party announced that Jewish and Muslim schoolchildren would not be offered an alternative meal if pork was served—they must either eat the pork or go without. That one incident sums up the Front National. Its members are not Nazis, but they’re not very friendly toward Jews either. 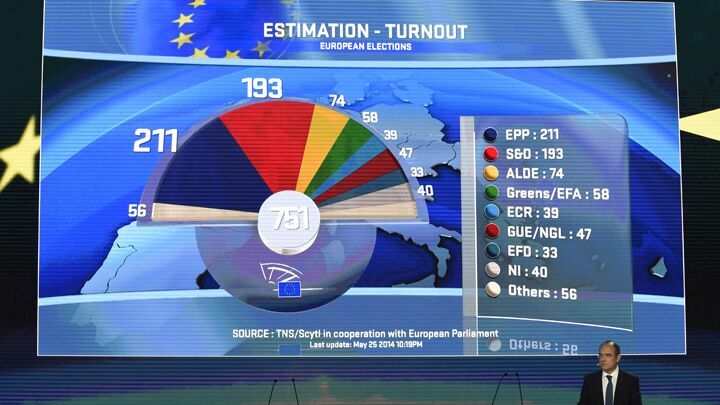 This result for the National Front is probably the biggest and most disturbing news from the European elections. Several more extreme parties made significant gains, but none have done as well as the National Front. Its policies are closer to those of the extreme groups that sprung up across Europe in the 1930s than they are to the parties that have dominated the post-war era. Its success shows that parties once believed to be beyond the pale have a serious future in Europe. Denmark was the third country to witness the victory of a euroskeptic party. The Danish People’s Party (dpp) won 27 percent of the vote, doubling its performance from last time and pushing the ruling Social Democrats into second place, with 19 percent. dpp leader Morten Messerschmidt said he wants to “pull Europe in another direction, namely in the British direction.” He aims to ally with Britain’s conservatives in the European Parliament. Denmark’s attitude to the EU is similar to Britain’s. They are the only two EU countries to have secured opt outs from the euro—all other EU countries are, in theory, obligated to join the euro once their economies are ready. This type of view is common, especially in northern Europe. Many leaders do not want to break with the EU entirely, but instead want a much looser arrangement. This could lead to a two-speed Europe, where a smaller group of countries form a “core Europe”—a closely integrated superstate, while other nations form an outer tier with much less cooperation. German Chancellor Angela Merkel won these elections by a reduced, but still comfortable, margin. The new German euroskeptic party, Alternative für Deutschland (afd), did surprisingly well, winning 7 percent of the vote. Under the motto “Have Courage to Be Germany” the afd called for Germany to reject the euro and return to the Deutschmark. Like the Danish dpp, the afd would also like to ally with David Cameron in the European Parliament, calling for reform of the EU rather than a complete exit. The other notable result from Germany was that its neo-Nazi npd won a seat in the European Parliament for the first time. The seat will be taken by Udo Voigt, who has called Hitler a “great man,” encouraged voters to rise up in “armed combat,” and demanded that “German lands” taken after World War ii be returned. The success of the npd does not come because of any surge in popularity—they received only 1 percent of the vote—but instead because the German Constitutional Court recently changed Germany’s EU election laws. Previously, parties had to win at least 3 percent of the vote to get a seat in the European Parliament. Now there is no threshold. This change also allowed the satirical parties Die Partei to win one seat, where it plans to “milk the EU like a small, southern European country.” Some of their other policies include rebuilding the Berlin Wall, building a wall around Switzerland, and establishing a quota system where 17 percent of all EU jobs are reserved for lazy people. A sub-group has called for a war of aggression against Liechtenstein. Greece is the only other country to send neo-Nazi’s to the European Parliament. There the Golden Dawn party won 10 percent of the vote and is Greece’s third most popular party. Six of its leaders are currently in jail and 18 of its politicians are under investigation and could face criminal charges. Meanwhile, victory went to Greece’s radical left party, Syriza, with 26.6 percent. The ruling New Democracy won 22.7 percent. The Panhellenic Socialist Movement, or pasok, which has dominated Greek politics since the 1970s won only 8 percent of the vote. Its support has collapsed completely since Greece received its disastrous bailouts. Mainstream parties are also struggling with collapsing support in Spain. In 2009, Spain’s top two parties, the Popular Party and the Socialist Party, won over 80 percent of the vote. This time, these two parties combined received under 50 percent. Just like Greece, Spain’s political landscape is changing completely in the wake of the euro crisis. One of its upstart parties, the left wing Podemos party—meaning “we can”—formed only two months ago, yet still managed to win 8 percent of the vote. Euroskeptic, far-right and fringe parties did well in many other countries. In Austria, the far-right Freedom Party (fpo) won just under 20 percent of the vote, coming third overall. Hungary’s far-right Jobbik came second, with 14 percent. In the Netherlands, Geert Wilders’s anti-Islam and euroskeptic Party for Freedom came third with 13 percent of the vote. The success of these fringe groups could bring more deadlock to the European Parliament. The Parliament’s traditional right-wing parties do not have enough seats to form a coalition by themselves. Neither do the left-wing groups. The only possible coalition will be a centralist coalition made up of the largest left-wing and right-wing block. This is business as usual for the EU Parliament. Except this time, this coalition would only control 54 percent of the seats. This makes it a lot easier for just a few meps to stall legislation. But the biggest takeway from these elections is a warning. Europe’s financial crisis has rocked its political structure. That structure has not fallen, though it has developed some major cracks. And that crisis is not over. It’s currently in intermission. The fundamental causes of that crisis have not been addressed. Europe’s traditional political system is struggling. How will it survive when things get even worse?